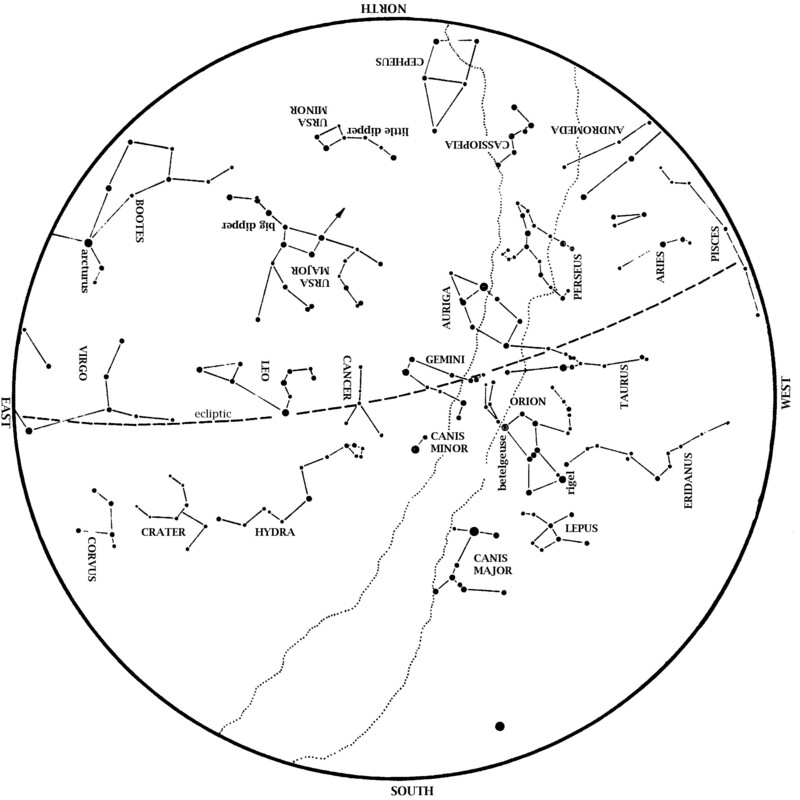 This star map shows the Houston sky at 9 pm CST on March 1, 9 pm CDT on March 15, and dusk on March 31. To use the map, put the direction you are facing at the bottom. Brilliant winter stars shift towards the southwest during March. Dazzling Orion is almost due south at dusk. His three-starred belt is halfway between reddish Betelgeuse and bluish Rigel. Orion’s belt points up to Aldebaran in Taurus the Bull. To Orion’s upper left are the twin stars Castor and Pollux, marking the heads of Gemini, the Twins. You can find Sirius, the brightest star we ever see at night, by drawing a line from Orion’s belt towards the horizon. To Orion’s left, about level with Betelgeuse, is Procyon, the Little Dog Star. From Sirius, look a little bit to the right and then straight down to the horizon. If your southern horizon is clear of clouds and tall earthly obstacles, you’ll see Canopus, the second brightest star ever visible at night. This star is so far south that most Americans never see it and many star maps made in the USA omit it. (You must be south of 37 degrees north—the latitude of the USA’s Four Corners—for Canopus to rise). As you view Canopus, keep in mind that the sky we see depends on our latitude as well as on time of year and time of night. Joining the winter stars are stars of spring rising in the east. Look for Leo, the Lion at dusk. Later in the evening, extend the Big Dipper’s handle to ‘Arc to Arcturus’ and then ‘speed on to Spica’; these stars rise at about 10:00 in early March but by 9pm on the 31st. 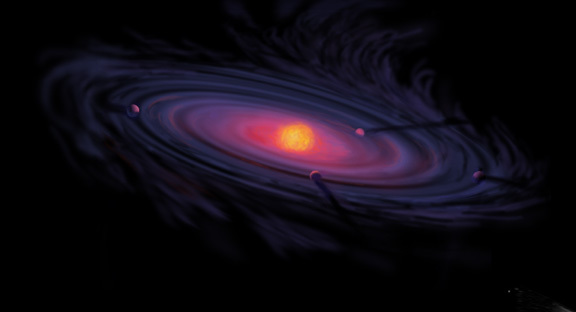 Artist’s concept of a protoplanetary disk, where particles of dust and grit collide and accrete forming planets or asteroids. Source: Wikimedia Commons. Venus slowly emerges into the evening sky this month. Look low to the horizon, over the point of sunset, to see when you first notice Venus. Venus outshines everything in the sky but the Sun and Moon, so you can look for it even in twilight. Early in March, look for Mercury to the upper right of Venus. Mercury, however, returns towards the Sun’s glare after Spring Break. By March 31, Venus sets about 1.5 hours after the Sun. Venus remains the evening star all spring and summer. Jupiter is due south at dawn; it outshines all the stars we ever see at night. Mars is in the south-southeast at dawn. It brightens a little each morning as moves away from Jupiter and towards Saturn. Mars closes to within 1.5 degrees of Saturn by March 31; closest approach is on April 2. Saturn is in the southeast at dawn this month. Full Mar. 1, 6:51 p.m.; Mar. 31, 7:37 a.m. Last Quarter Mar. 9, 5:20 a.m.
New Mar. 17, 8:12 a.m. 1st Quarter Mar. 24, 10:35 a.m.
Sunday, March 11, is the second Sunday of March. Accordingly, Daylight Saving Time begins at 2:00 am on this date. (The time jumps from 1:59 am to 3:00, skipping the 2:00 hour). Don’t forget to set your clocks forward one hour Saturday night, March 10! At 11:15 am on Tuesday, March 20, 2017, the Sun is directly overhead at the equator, shifting northwards. Therefore, this is the vernal equinox, often called the first day of spring. On this day everyone has the same amount of daylight. After this day, day is longer than night for us in the Northern Hemisphere. Below the equator, night becomes longer than day after this date, making this the autumnal (fall) equinox for them.